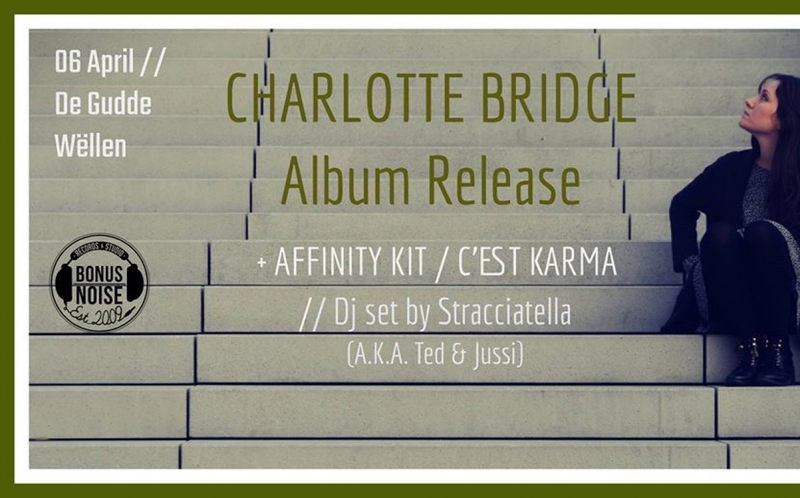 BONUS NOISE is delighted to invite you to Charlotte Bridge's album release show. The 10 song album, STEPS, features new facets of her unique sound, blending guitar arpeggios with electronic beats, dreamy synths and delicate voices. Her melancholic tones and nostalgic melodies are created through a fusion of acoustic, analog and digital, making her a discovery suited both for day dreamers and night owls alike. AFFINITY KIT: Somewhere between necessary optimism and hopeful melancholy Affinity Kit picks and strums through a musical landscape having its roots in the singer/songwriter world, though not backing off from modern and electronic accents. Through a broad bandwidth and great love for detail, the songs get a unique character whose pop appeal affinity kit doesn't have or want to deny. C'EST KARMA: C’est Karma has played music for all her life. It all got serious, when in the summer of 2015 she strummed her guitar strings for the first time. Quickly grasping the music should be heard she started busking the streets of Luxembourg and song writing, a process she masters partly also because of her successes as a poetry slam artist. Her smooth and smoky voice cuts right through every venue. A mix of „Daughter’s“ intimacy and the power of a young unstoppable Sinead O’Connor: C’est Karma continues to baffle audiences with her intimate music and her authentic, youthful spirit.